EISEL, TIIEODOR SEUSS (1904- 1991) American car¬toonist, author and publisher born in Springfield, Mas-sachusetts. on March 2, 1904. Theodor (“Dr. Scuss“) Geisel went to Dartmouth College and graduated in 1925. His cartoons in the campus humor magazine at¬tracted the attention of Norman Anthony of Judge, and soon his Birdsies and Beastics page of nonsense was a weekly feature. It consisted of various soberly couched explanations of natural history and animal life—all, of course, absolutely absurd—with the wildest concoctions in the cartoons that illustrated the captions. 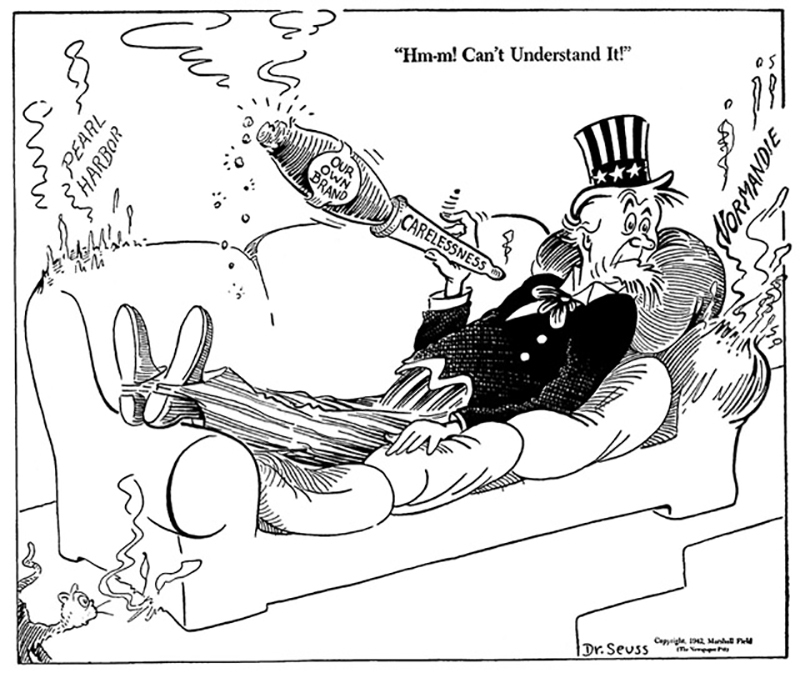 Soon Dr. Seuss’s name was appearing on gags and strips inside the magazine and on color covers. After Anthony switched to Life magazine, Dr. Seuss’s zany humor was sought there as well; his chores were similar, except that his page was retitled Life’s Zoological Charts. His other work at this time included cartoons for Vanity Foir and Liberty, as well as advertising campaigns for insecticides (“Quick. Ilenry, the Flit!” was a classic series). As the magazines faded during the Depression years, Dr. Seuss began turning out children’s books of a variety that delighted adults with their whimsy and enchanted children with colors, rhymes and comical drawings. During World War 11 he served with the Army Signal Corps and Educational Division and won. among other distinctions, the Legion of Merit for his film work. In the 1940s his versatility led him to conquer ever more fields; he drew political cartoons for the newspaper PM in New York and entered the field of animation, winning Academy Awards in 1946 (Best Documentary Short for HiflerLives), 1947 (Best Documentary Feature for Design for Death) and 1951 (Best Animated Cartoon for the strikingly innovative Gerald McBoing Boing). expression in Sesame Street and other modern ap¬proaches to children’s education. Lately Dr. Seuss has entered the TV world, animating many of his creations and winning awards thereby (Pea¬body awards for How the Grinch Stole Christmas and Horton Hears a Who; Critics’ Award at the Zagreb festi¬val for The Lorax). Among his other credits arc honorary degrees from his alma mater (he also studied at Lincoln College, Oxford, England, in 1925-26} and from Ameri¬can International College. He has continued his educa¬tional work as president of the Beginners Book Division of Random House and publisher of Bright and Early Books. He also designed a line of toys for Mattel and furniture for Sears, Roebuck. 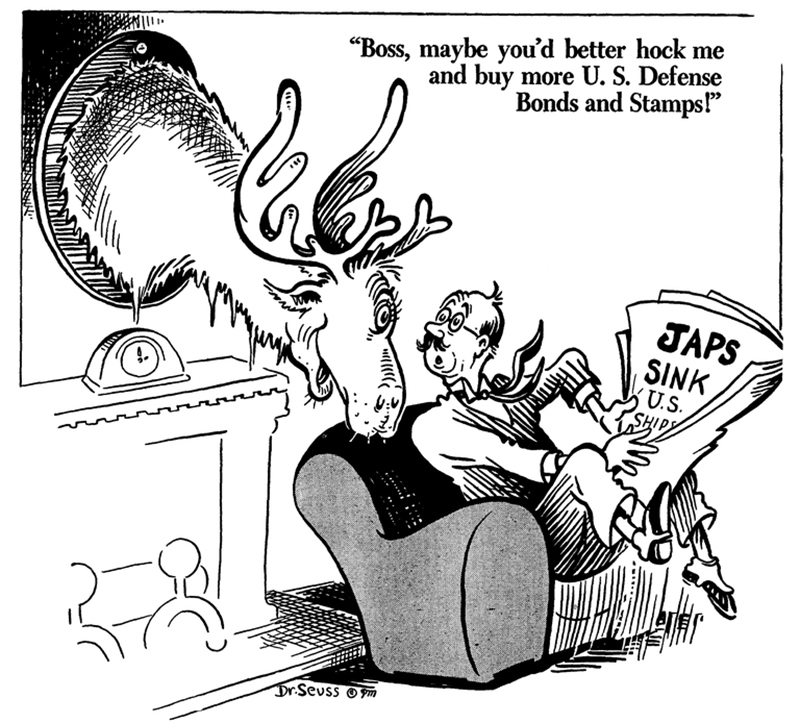 Dr. Seuss, for all his activities, remains basically a cartoonist, one of the profession’s proudest members. Ilis work is always a special mixture of drawings and thoughts, with a unique sense of humor thrown in. His cartoon style has consistently been one of confident but loose pen lines, with a masterful use of composition and color. His animal creations are classics, supremely logi¬cal in an inimitably Seussian way. Most of his books are readily available, but the early cartoon work of this genius—nonsense easily the equal of Perelman’s—begs republication for audiences who, without regard to gen¬eration or background, could not fail to fall in love with il and be enchanted by its humor. Books: A nd to Think That I Saw It on Mulberry Street; The 500 Hats of Bartholomew Cubbins: The Seven Lady Godivas; The King’s Stilts; Horton Hatches the Egg; McEUigoFs Pool; Thidwick the Big-Hearted Moose; Bartholomew and the Ooblick: The Lorax; Marvin K. Mooney, Will You Please Go Now.’; Did 1 Ever Tell You How’ Lucky You Are? ; The Shape of Me and Other Stuff; There’s a W’ocket in My Pocket; Great Day for Up; Oh, the Thinks You Can 7’hinkf; The Cat’s Quizzer; Scratnhied Eggs Super; Horton Hears a Who; On Beyond Zebra: If I Bon the Circus;How the Grinch Stole Christmas; The Cat in the Hat: The Cat in the Hot Comes Back; YertJe the Turtle; Happy Birthday; One Fish Two Fish Red Fi.sh Blue Fish; Green Eggs and Ham; The Sneelchesand Oth¬er Stories; Dr. Seuss’ Sleep Book; Hop on Pop; Dr. Seuss’ ABC Book; Fox in Socks; I Hod Trouble in Getting to Solla Sol/ew; The Cat in the Hat Songhook; The Fool Book; 1 Can Lick 30 Tigers Today and Other Stories: My Book About Me; I Can Draw It Myself; Mr. Brown Can Moo. Can You? ; and many others.